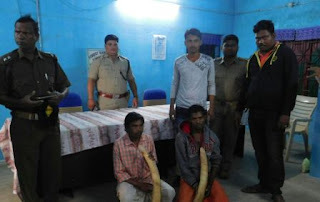 Acting on a tip-off, a team of Boudh forest officials arrested two persons while they were negotiating sale of tusks on Tuesday morning. Sources said the team led by ACF Sushil Tripathy and DFO Yashobant Seth nabbed two persons while negotiating sale of two tusks from Ghat road near Matakrupa reserve forest in Kantamal forest range in Boudh district, 75 km from here. The two tusks weighed 5.9 kg and the local value of the seized tusks would be around Rs 21 lakh and in the international market it would be around Rs 8 lakh, said forest office sources. Forest officials suspect that a gang is operating in Boudh and Kandhamal area and carrying out this illegal trade of wildlife products.